The Gold Coast 600 started with the end of a drought and finished a washout, but who whipped up a storm and who washed up? They say that motorsport is anything but predictable and Mother Nature intervened to play her role on Sunday, shortening the 600km endurance event to just one 300km race. While the cars did actually run in race 27 on Sunday, torrid conditions forced the officials to abandon the race before making the half-way mark, meaning no points were awarded and only Saturday’s race really happened. Despite the obviously shortened weekend, the opening 300km battle in race 26 provided enough entertainment to justify the admission costs with the top pecking order including a few near-forgotten faces. 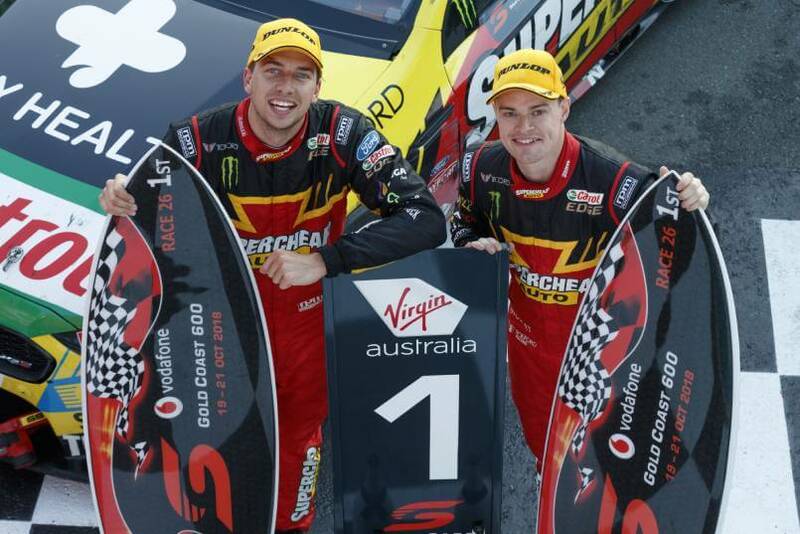 Chaz Mostert and James Moffat came into the Enduro Cup as a pairing which had never worked together before and with clouds hanging over both of their heads. While Mostert was facing a 12 month winless streak rolling up to Surfers Paradise, Moffat hadn’t won a race since Winton in 2013 under a cloud of controversy for Nissan. However, after an impressive fourth place at Bathurst, the duo combined with their years of experience to dominate proceedings in Saturday’s race at the Gold Coast. Moffat, along with a majority of the co-drivers, did most of the heavy lifting, driving a majority of the laps in the race before handing the car over to Mostert in the lead. Only having to bring it home straight, Mostert pushed to the flag but came first, replicating his last success 364 days prior at the same venue while Moffat gave his family their first win in a Ford since his father Allan won the 1988 Sandown 500 in a Ford Sierra RS500. Bouncing back after a terrible season, Mostert will hope to keep up the strong form across the ditch in New Zealand. Craig Lowndes and Steven Richards were all the rage after this year’s Bathurst 1000, leading the Enduro Cup as their time together came to a close. With Lowndes retiring from full-time racing next year, the swansong tour for the duo looked like they had taken a dive from heroes to zeroes when Lowndes qualified the #888 in 21st on Saturday after a penalty. Starting the car against a field of co-drivers, the veteran racer sliced his way through the pack and, thanks to a safety car, handed the Commodore over to Richards in sixth position as the other co-drivers remained in the car. Good strategy coupled with a few classic and clinical passes towards the end of the race saw Lowndes and Richards finish second after starting outside of the top 20, a result which ended up earning them the Enduro Cup after Sunday’s washout. A bittersweet result, Lowndes will no doubt use it as leverage next year as he is bound to slot in to a co-driver seat with either his old partner in crime Jamie Whincup or become the next in the revolving door of co-drivers for Shane van Gisbergen. James Courtney and Jack Perkins had not much good to write home about in their 2018 endurance campaign together thanks to two below averages outings at Sandown and Bathurst. Finishing a lowly 16th at Sandown and being the first car out due to an engine issue at Mount Panorama, Walkinshaw Andretti United’s poster boys wanted to turn things around at Surfers Paradise. Starting tenth thanks to a kerb strike for Courtney in the top ten shootout, both drivers sliced their way through the pack before a risky strategy at the end saw them undercut the field bar Mostert by coming in a lap before the theoretical critical lap to make it home. While Lowndes got past for third, a valiant drive from Courtney saw him hold off David Reynolds for the final spot on the podium, shocking everyone by making the finish on an allegedly compromised strategy. After such a tough year for Courtney, now sitting 15th in the championship, the result will be a boost to the 2010 championship winner’s confidence as he sets his sights on 2019 and beyond. Anton de Pasqule and Will Brown have been the surprising rookies in this year’s endurance series after a scintillating start at Bathurst was only just overshadowed by their race falling apart early. Heading to the Gold Coast with confidence, de Pasquale struggled in qualifying, only managing 17th in the short session. Brown started the car and was keeping his nose clean until a moment at the first chicane saw his clip the inside wall, sending the #99 pinballing towards the outside fence. Striken in the middle of the track, Brown was struck by Steve Owen in the #56 who arrived late on the scene with nowhere to go, adding to the massive damage on the Erebus machine. Obviously while crashing out was not what the doctor ordered for the young duo, the positive from the rounds is the impressive showing at Bathurst which pencilled in both drivers as potential future champions. Jamie Whincup and Paul Dumbrell had an unfortunately typical Enduro Cup where only a few of the elements came together while quite a few went completely missing. After dominating the Sandown 500, a departing wheel at Bathurst ruined what could have been a great campaign. With Whincup qualifying the #1 in second for the opening 300km race at the Gold Coast, all looked to be well until Dumbrell made contact with leader Alex Premat on the second lap, moving himself into the lead while the #17 dropped down the order to fifth. Lucky to avoid a penalty, their luck soon caught up with them as Dumbrell stalled the car leaving the pits, losing spots but then emerging into the fast lane right in the door of Moffat, earning himself a drive through penalty while also holding up Earl Bamber in the #97 car on exit. From there, a fightback only saw Whincup finish 14th, way down the order on where they should have ended up. Dumbrell and Whincup will be happy at race 27 being abandoned as the former fenced the car as the rain came down, ending their race and seemingly his co-driver career in the process. Nissan Motorsport could have been in for a strong showing on the Gold Coast, at least given the form in practice leading in to the racing weekend proper. Rick Kelly topped the opening practice session in his Altima before his co-driver Garry Jacobson undid all the hard work by putting the car into the wall in the next hit out, putting the #15 crew on the back foot for the rest of the weekend. The Michael Caruso/Dean Fiore #23 car developed an engine drama early on in the 102 lap Saturday race, making it a long afternoon for the duo. Rick Kelly was on for a top ten late in the piece before suspension damage sustained on the back chicane forced him to park the car. Surprisingly, the #78 entry of Simona de Silvestro and Alex Rullo was the best performing Nissan, finishing a disappointing 18th, one spot ahead of Andre Heimgartner and Aaren Russell in the #7 machine. After a dismal weekend, the Melbourne squad will want to give Nissan a proper sendoff as the time as a factory team draws to a close. A trip across the ditch is next on the cards, heading to the penultimate round at Pukekohe Park in New Zealand. The Auckland venue was the scene of championship changing races last year as the two key Kiwis return this year to battle it out for the title in front of their home crowd.